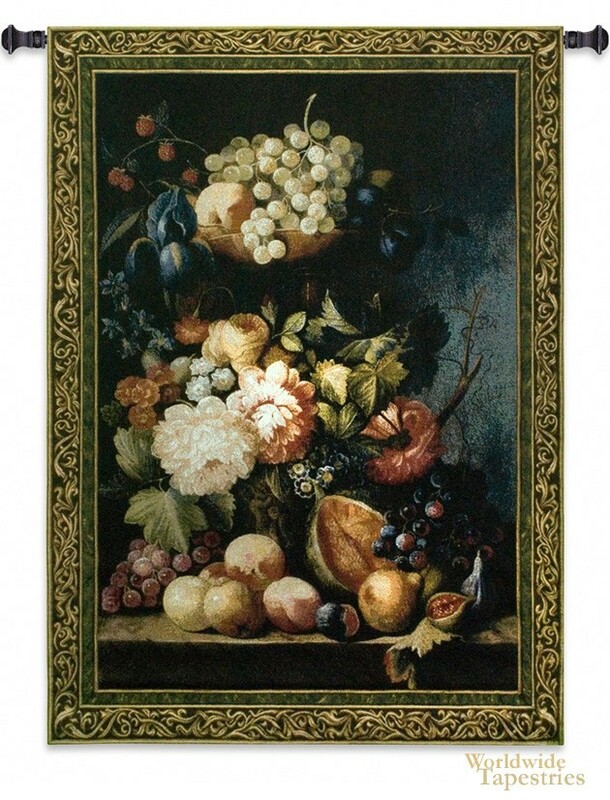 This masterful tapestry "Fruit Medley" shows a sumptuous feast of fruit and flowers by Bianchi. The hallmark of Bianchi's work is his masterful use of light. Here in this piece we see the nuances of each fruit and flower delicately illuminated by the soft light. The flowers are in full bloom and the fruit are ripe and include peaches, apples, grapes, melons and figs. Rich in composition and harmonious in its use of color, this tapestry is a celebration of the art of still life in the style of the Dutch master painters. This floral tapestry "Fruit Medley" is backed with a lining and has a tunnel for easy hanging. Note: tapestry rod and tassels, where pictured, are purchased separately. Dimensions: W 53" x H 76"